Both policy reforms and face-to-face caring are fundamental components of a just society. 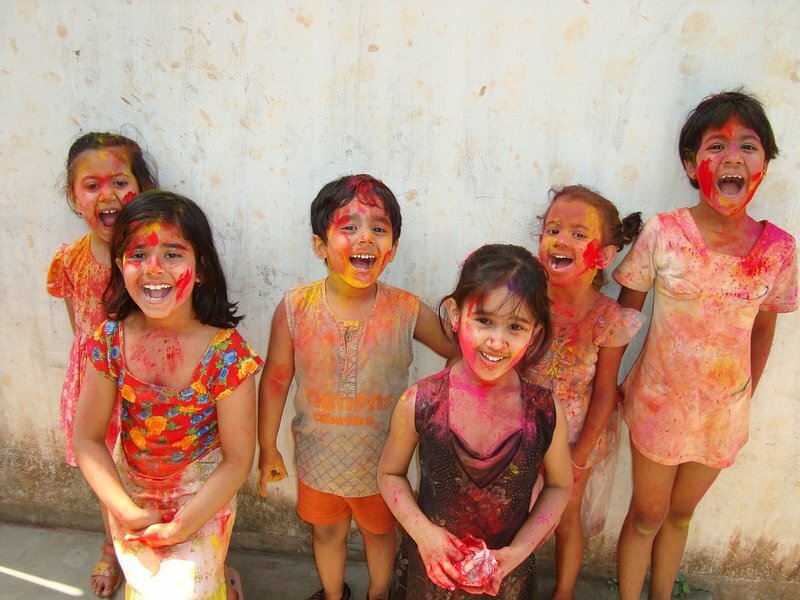 Children on Holi Day in India. Credit: Pixabay/shekharchopra85. CC0 Public Domain. The gravity of the situation of India’s most vulnerable children escapes attention because it’s an under-reported topic in the media and hasn’t been prioritised by government, thus leading to a lack of awareness among the general public as a whole. But there are approximately 30 million orphaned and abandoned children in the country according to UNICEF. These children make up four per cent of the country’s child population, and they are struggling to survive in the most vulnerable conditions, prone to exploitation since they are so far off the government’s radar screen. According to the Ministry of Women and Child Development only 470,000 of these children were living in institutionalised care as of 2017. This figure actually fell to 260,000 in 2018 so clearly these are unreliable statistics. But even if we stick to the higher end of the official numbers only a tiny fraction of children in care are placed for adoption, and are eventually adopted. Adoption is a much better option for a child's overall development because children thrive in a loving and supportive environment that gives them more space and opportunities to realise themselves. However, adoption levels have always been low in India due to lack of awareness and social prejudices. Between April 2017 and March 2018, for example, there were only 3,276 in-country adoptions in India according to the Central Adoption and Resource Authority’s statistics, with a mere 20,000 parents waiting to adopt. These are abysmal figures for a country with the world’s second largest population. No-one knows where the rest of those 30 million orphaned and abandoned children end up: “We don’t know whether the children are being trafficked, or whether they are ending up on the streets, being used as child labour, or being absorbed in their communities. We just don’t know whether they are safe,” adoption campaigners told me. Faced by these data it’s easy to feel disempowered, but a group of adoptive mothers are taking matters into their own hands by launching a new campaign called “Where are India’s Children.” Currently, the Indian government is ignoring this extremely vulnerable yet important segment of society because children don’t have a voice and they don’t constitute a vote bank. Smriti Gupta and Protima Sharma, the two leaders of the campaign, are working with a core team of five and a broader group of volunteers to create awareness of India’s broken system of childcare and adoption and give as many of those 30 million children the chance of a better life. Each of the core team members has already fulfilled this goal in a personal sense by choosing to have children through adoption themselves. Smriti always knew she would eventually adopt, finding India’s vast economic disparities unsettling and the injustice of denying so many children a home through accident of birth completely unacceptable. She adopted her first child, a daughter, in 2014 and her second daughter in 2016. But the campaign is also active at the broader poitical level. Before India celebrates Children’s Day on November 14 2018, the core team aims to leverage social media to collect strength in numbers through registrations so that on the day itself, all registered members of the campaign can send messages to the Indian government in an attempt to force them to pay attention. After November 14 the on-ground battle will begin, one district at a time, by engaging with local politicians and district officials to discuss problems in the child welfare system and present them with potential solutions that they hope can be used as models for practical implementation. One of the key asks of the campaign is to promote transparency via a monthly report that monitors results and publicizes progress. This, they hope, will create more accountability. The campaigners also want to make child welfare an autonomous constitutional body so that the implementation of policies is stronger and more efficient. “Despite the presence of District Child Protect Units (DCPU) and Child Welfare Committees, five per cent of abandoned and orphaned children reach shelters, and barely 2,000 are in the adoption stream. Currently there are 40-50,000 children who can be brought into adoption,” says the campaign team. What came through most strongly from my conversations with the campaigners is that they see no fault-line between personal and political action – between the social duty of adopting children themselves and fighting for radical improvements in national childcare and adoption policies. It’s also impossible to tell exactly which comes first, and whether these women became activists before or after they adopted, but it seems to be a circular process: they wouldn’t have adopted children if they didn’t embody a passionate sense of care and compassion for others, but their social activism wouldn’t have extended outside of their homes if they hadn’t experienced the broken system of child welfare and adoption in India directly. “It all starts with a belief. And if there is one thing I do in my life, it will be this,” says Smriti, citing the Bhagavad Gita. “I'm doing my duty without feeling entitled to the fruits of my actions.” By committing themselves to the cause of children both inside and outside their homes, the group is determined to challenge a status-quo which is denying children the right to a family and a chance to thrive in a loving and supportive environment. Another of the core team members is Meera Marthi, who adopted her son in 2012 and is also an adoption counsellor. “Democracy needs people’s voices and [for them] to come together,” she told me. The numbers can seem overwhelming, but instead of letting the scale of the problem dissuade them the campaigners are using their personal experiences of adoption as a springboard for action. These personal experiences allow for the development of greater empathy and determination, and it’s those qualities that help to create strong and sustainable social movements. #MeToo has become a powerful global movement on the back of millions of women speaking up about their own experiences with sexual assault and harassment. The organisers of “Where are India’s Children” aim to do something similar, building off the individual experiences of parents with adopted children but extending the campaign into a broader movement by finding more people who care. “And people do care,” says Smriti. Many may have become indifferent and others perhaps simply don’t know what to do, but building awareness might instill greater zeal in the public to make a change. Most people vacillate between hope and resignation when it comes to seemingly intractable problems. But Protima, Meera, Smriti and the rest of this group of adoptive mothers see both the big picture and the responsibility for face-to-face caring that are fundamental components of a just and decent society. It’s the small, patient but collective efforts of a larger united group that leads to radical change.